WASHINGTON, D.C. and New Orleans, LA — Today, the National Fair Housing Alliance (NFHA), GNOFHAC, and 18 fair housing organizations from across the country filed a housing discrimination lawsuit in federal district court in Chicago, IL against Deutsche Bank; Deutsche Bank National Trust; Deutsche Bank Trust Company Americas; Ocwen Financial Corp.; and Altisource Portfolio Solutions, Inc. Ocwen and Altisource are the servicer and property management company responsible for maintaining and marketing a large number of Deutsche Bank’s properties. NFHA is filing this lawsuit on the first day of Black History Month to highlight how neglected bank-owned homes hurt African American communities. The lawsuit alleges that Deutsche Bank purposely failed to maintain its foreclosed bank-owned homes (also known as real estate owned or “REO” properties) in middle- and working-class African-American and Latino neighborhoods in 30 metropolitan areas, while it consistently maintained similar bank-owned homes in white neighborhoods. The data presented in the federal lawsuit, which is supported by substantial photographic evidence, shows a stark pattern of discriminatory conduct by Deutsche Bank/Ocwen/Altisource in the maintenance of foreclosed homes. 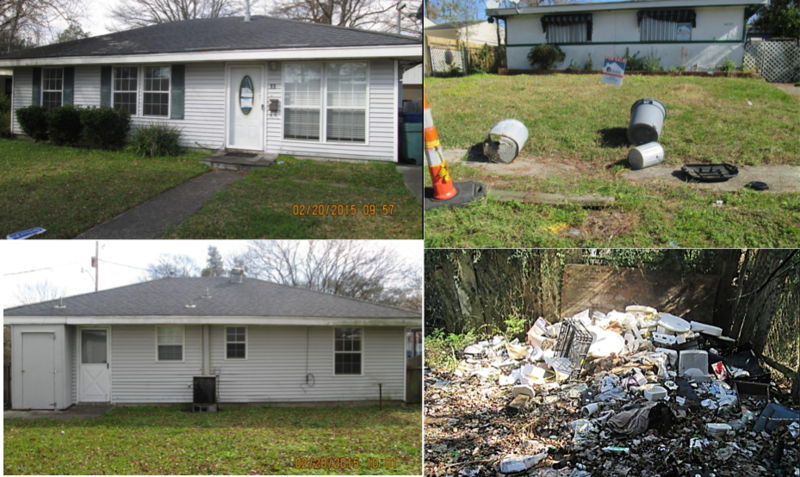 The negligent maintenance of homes in communities of color resulted in these homes having wildly overgrown grass and weeds, unlocked doors and windows, broken doors and windows, dead animals decaying, and trash and debris left in yards. Deutsche Bank/Ocwen/Altisource are paid and under contract to provide routine maintenance and marketing to these bank-owned homes. This includes regular lawn mowing, securing a home’s windows and doors, covering dryer vent holes and other holes to keep animals and insects from nesting, keeping the property free of debris, trash, branches and weeds, and complying with nuisance abatement ordinances in each city. Front/rear view of well-maintained Deutsche Bank property in a white neighborhood in New Orleans (left), contrasted with front/rear of a badly-maintained Deutsche Bank property in an African American neighborhood in New Orleans (right). The lawsuit is the result of a multi-year investigation undertaken by NFHA and its fair housing agency partners beginning in 2010. “We chose to first file administrative complaints with HUD against Deutsche Bank, expecting the bank to review our evidence and implement changes to secure, maintain, and market its bank-owned homes in communities of color to the same standard it did in white neighborhoods,” said Shanna L. Smith, President & CEO of NFHA. “However, even after meeting with Deutsche Bank’s legal counsel in April 2015 and sharing photographs illustrating the significant differences in treatment between homes in African American/Latino and white neighborhoods, we saw no improvement,” Smith continued. NFHA also met with representatives from Ocwen and Altisource and shared photographs of problems. No improvements with routine maintenance and marketing issues were identified following those meetings, so NFHA, GNOFHAC, and the 18 other fair housing agencies amended the HUD complaint to add these companies. The lawsuit points out that Deutsche Bank-owned homes in predominantly white working- and middle-class neighborhoods are far more likely to have the lawns mowed and edged regularly, invasive weeds and vines removed, windows and doors secured or repaired, litter, debris and trash removed, leaves raked, and graffiti erased from the property. NFHA, GNOFHAC, and the 18 other fair housing agencies collected evidence at each property on over 35 data points that were identified as important to protecting and securing the homes. Investigators also took and closely reviewed nearly 30,000 photographs of Deutsche Bank-owned homes to document the differences in treatment between communities of color and white neighborhoods. NFHA and GNOFHAC conducted repeat visits to several Deutsche Bank-owned homes over the course of the investigation. However, investigators found little or no improvement in maintenance and often found the homes in worse condition. The neglected appearance of Deutsche Bank-owned homes in middle- and working-class neighborhoods of color destroys the homes’ curb appeal for prospective homebuyers and invites vandalism because the homes appear to be abandoned. Additionally, the blight created by Deutsche Bank/Ocwen/Altisource results in a decline in home values for African American and Latino families who live next door or nearby, deepening the racial wealth gap and inequality in America. This is not a new problem for Deutsche Bank. In June 2013, Deutsche Bank, as trustee and owner of record of foreclosed homes, settled a lawsuit with the City of Los Angeles for $10 million after it was accused of allowing hundreds of foreclosed properties to fall into slum conditions, leading to the destabilization of whole communities. In the past, Deutsche Bank has taken the position that as a trustee of the loans that resulted in foreclosure, it has no legal obligation to maintain the properties once they come into Deutsche Bank’s possession. And yet, Deutsche Bank agreed to settle the City’s claims and required its preservation maintenance companies to pay most of the $10 million to resolve that case. Under the Fair Housing Act, trustees are clearly liable for discriminatory activity to the same extent as any other owner of property. In 2011, NFHA released the first of three reports documenting poor routine maintenance of foreclosed homes in African American and Latino neighborhoods as compared to foreclosures in white neighborhoods. Many photographs of badly-maintained bank-owned homes were shared. Each report recommended best practices to avoid Fair Housing Act violations. “We truly hoped the release of the reports, which included advice on how to comply with civil rights laws, would change the banks’ behavior,” said Smith. “However, only a few banks reached out for meetings to develop best practices, and Deutsche Bank was not one of them.” The second report was released in 2012 and the last one in 2014. The HUD complaint was filed and then amended to add additional cities and new evidence on the following dates: February 26, 2014; April 30, 2014; August 7, 2014; January 22, 2015; August 5, 2016; February 14, 2017; and July 26, 2017. NFHA and its member agencies are represented by Soule, Bradtke & Lambert and Relman, Dane & Colfax PLLC. The work that provided the basis for this publication was supported, in part, by funding under a grant with the U.S. Department of Housing and Urban Development. The author and publisher are solely responsible for the accuracy of the statements and interpretations contained in this publication. Such interpretations do not necessarily reflect the views of the Federal Government.